Isn't it kind of morbid to give a guy a codename that will constantly remind him of the way his parents were killed? Orphaned at the age of three by a drunk driver, Hit & Run grew up in a county institution from which he escaped with alarming regularity, climbing down sheer walls and running for miles across the plains in the middle of the night. When asked what he was running away from, he replied, "I'm not running away from anything. I'm practicing." He went from the custody of the county directly into the United States Army, where he quickly earned their Achievement Medal. He was tapped soon after for the GI Joe team, where he finally found himself in a "family." Hit & Run likes nothing more than to rappel down a line into remote locations to pinpoint hidden Cobra bases. He bolts from target to target, taking down enemy forces like a human pinball before they even realize they have been infiltrated. It doesn't matter how deep the jungle, how treacherous the mountain, or how numerous the combatants, he will find a way to neutralize them. 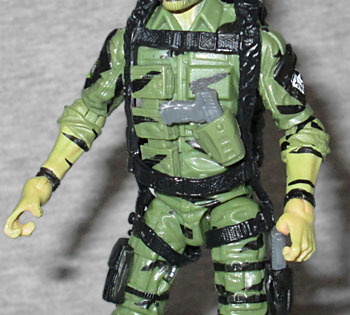 When FSS Hit & Run was first revealed, his face and arms were painted pink - kind of a bummer, since the character's trademark was that he was all painted up with green camo. To their credit, the Club listened to fan complaints and wasted no time in fixing the issue. The final product is sort of a yellowish green, which isn't quite vintage-accurate (his camo pretty much matched his clothes), but it's better than pink. Although, if it had been released with pink skin, he would have counted as a reference to the Brazilian release "Alpinista" - that was H&R without the green bodypaint. Yet again we've got a FSS 3.0 figure who's a "de-Night-Forcing" of one in the Nocturnal Fire convention set, so this head first appeared there. Of course, in that set, it was completely skintone, without any camo paint at all, so this is still a new way to see it. For some reason, the Club decided to give him some stubble, but it's painted very... mechanically. It's less of a shadow and more of a halftone print. Very conspicuous when viewed at anything other than a distance. 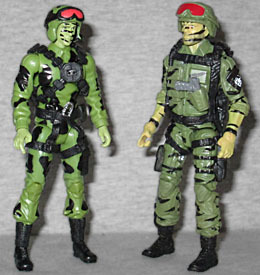 H&R is mainly built from Lifeline's body, as evidenced by the distinctive set of pockets running down the right side of his chest and the hypospray on his leg. The arms come from Mouse, so that provides him with short sleeves. The clothes are a dark olive drab with black tiger stripe camo painted on. For some reason, his right wrist is sculpted as though the hinge part of the joint is running the opposite direction than it really does. He's wearing a new backpack that can only be removed if you disassemble the figure's legs. Well, semi-new: yes, it came with the Night Force figure, but it was originally designed to come with Lifeline; it's just that he was already coming with so much stuff that it had to be dropped. 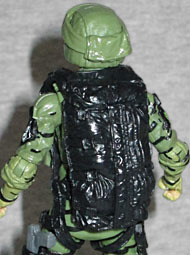 The sculpt of the actual parachute part is the one first seen on Renegades Ripcord, but that plugged in like a backpack rather than having its own integrated web gear. Actually, why does Hit & Run have a parachute at all? He's running around the woods, not jumping out of planes. At most, he's rappelling down mountains. That's why the 1988 original came with a duffel bag that unspooled a rope. Ah, but there was also a Target exclusive that included all the same accessories as the normal figure, plus a bonus in the form of the 1985 mail-away Parachute Pack! So consider this accessory a reference to that. 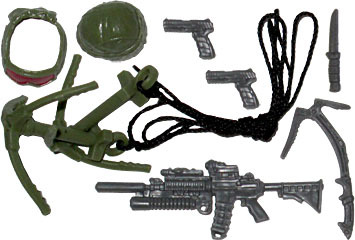 Hit & Run's other accessories include a helmet and goggles, a climbing axe, two grappling hooks tied by a length of cord, and a SOPMOD M4A1 kitted out with an underslung grenade launcher, a laser sight, a flash suppressor and more. He also has a knife in his boot, and two pistols that holster on his chest and left leg. 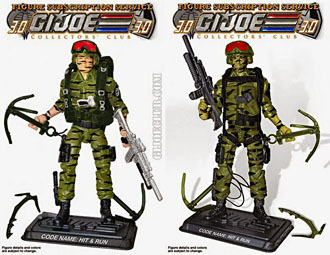 Hit & Run is a good enough figure, but he's kind of unnecessary: Hasbro already released a Generation 3 version of him in the Assault on Cobra Island box set. And yes, this one is better, but it's not that much better. Instead of a new character, or even an old character in a new uniform, the Club used a subscription slot on a minor upgrade, and that's weird.